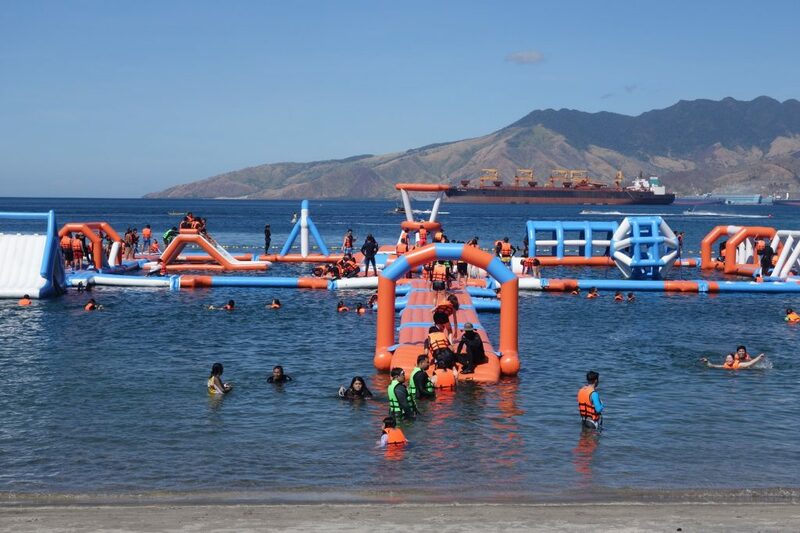 Inflatable Island, located in Subic Bay, is the BIGGEST floating water playground in Asia. How big is big? At 3,400 sqm, it’s as big as 8 basketball courts put together side by side! In this exciting waterpark, guests can go down huge inflatable slides, swing on bridges, be catapulted on human launchers, and so much more! 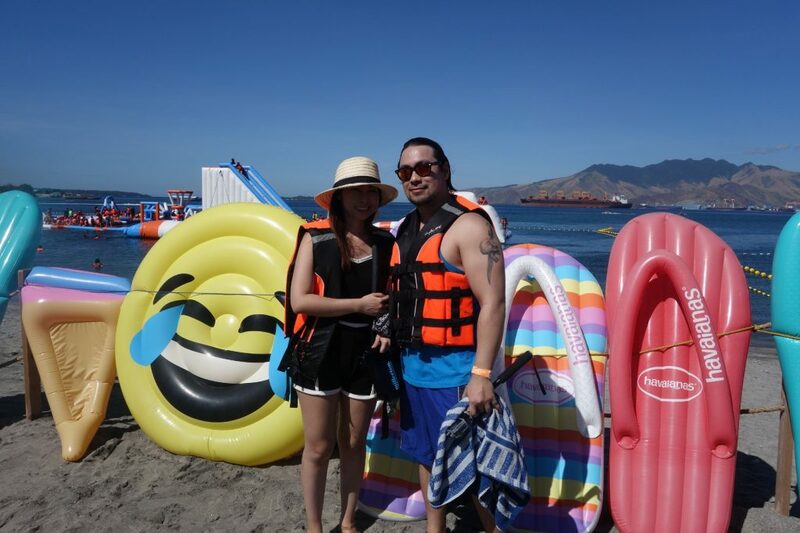 When Inflatable Island invited me and my family for a visit, I made sure I was ready. Sunscreen? Got it! Underwater action cam? Fully charged! Digital camera and SD cards? Check and check! Waterproof bag? I’m on it! Basically, the only thing that wasn’t ready was my bikini body! Sadly, when I got there, my action cam was not turning on, and I accidentally submerged my beloved camera in the water. Don’t ask me why because it’s a long story and I’d rather not relive the pain, but let’s just say it wasn’t my lucky day. 🙁 Hence, I don’t have that many photos from our visit. That just means I’ll have to go back some other time (and make sure not to break my gadgets next time)! Anyway, even though I don’t have that many photos, I can still share my thoughts about the Inflatable Island, in case you are curious about this place you keep seeing photos of on your Instagram feed! It’s only 3 hours away from Metro Manila! 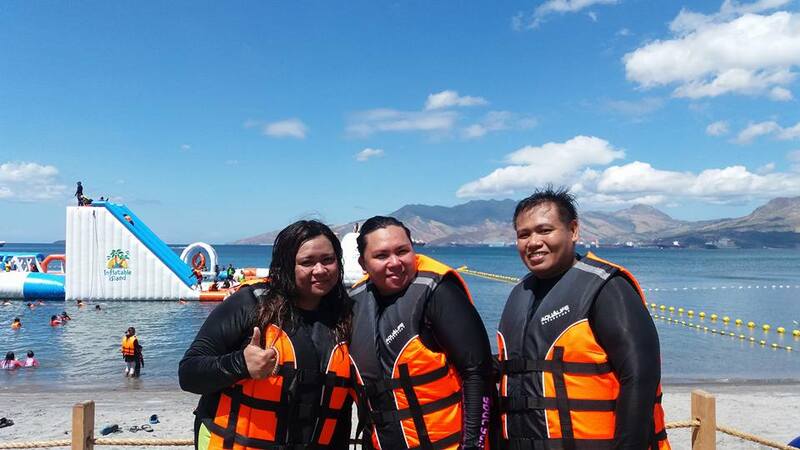 When all you can afford or manage is a quick weekend road trip or day trip, you’ll be happy to know that the Inflatable Island is only a 3-hour drive from Manila! No car? No problem! 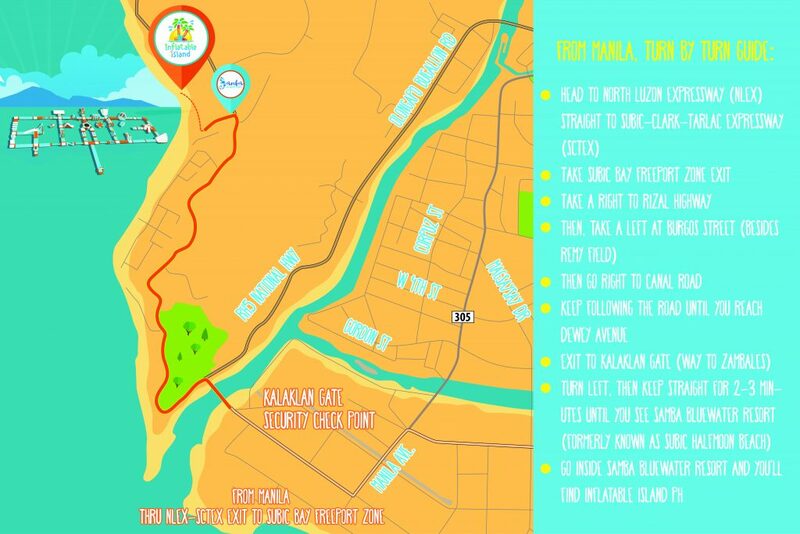 You can get to the Inflatable Island via public transportation too. 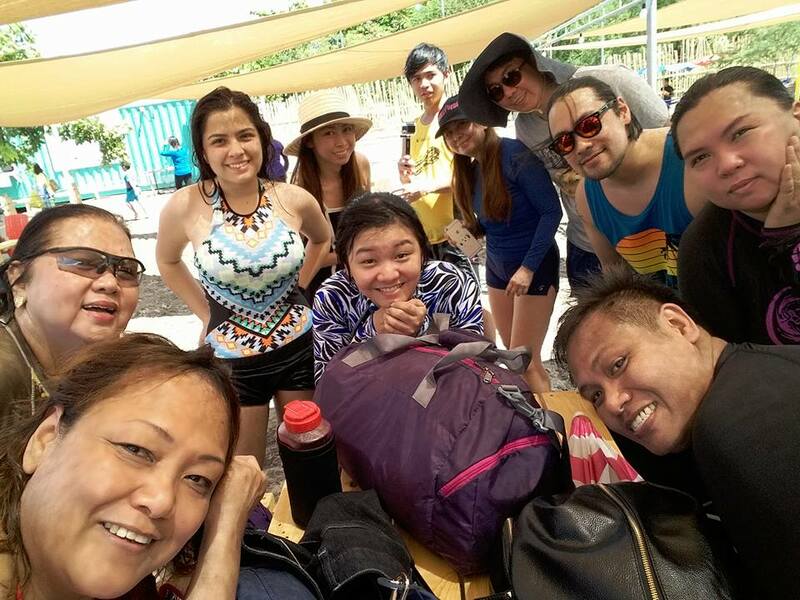 From Cubao, just ride any bus headed to Olongapo or Iba, Zambales, then ride a jeep going to Samba Blue Water Resort. Trampolines, monkey vines, jungle bars, and kiddie slides… wheee! Does the sound of those make you squeal in delight? 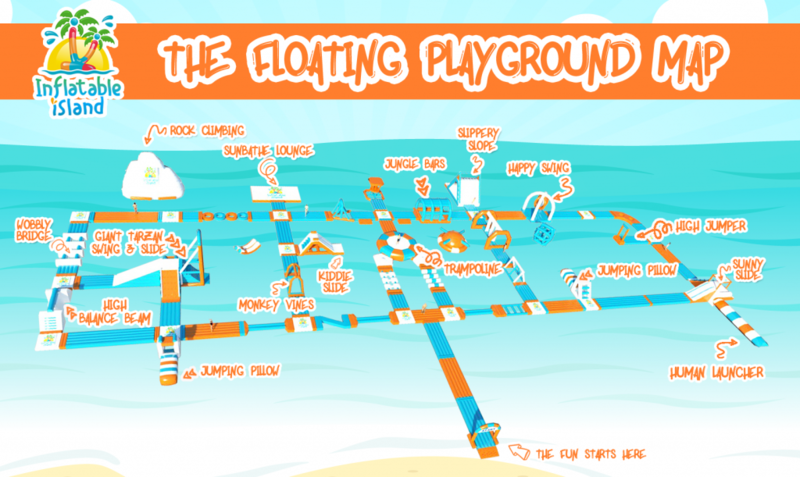 You’ll definitely feel like a child again as you jump, bounce, and play on the inflatables! Now the tough part is this: with so many inflatables, where do you start? It’s not just for kids! Just because this is a place where you can unleash your inner child doesn’t mean that it’s all child’s play. Nope. Expect to burn calories and work out here. In fact, my husband and my fully grown cousins said that going on the inflatables was definitely challenging, and one of my cousins even said that her muscles got sore after all that action! 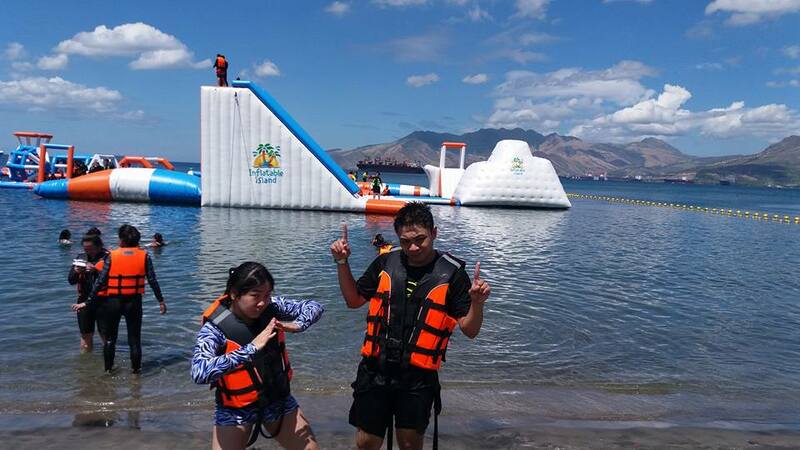 At the Inflatable Island, you get to have fun AND exercise at the same time! That’s an unbeatable combination! These are the fully grown cousins who I was referring to! It’s a great place to bond with the family. 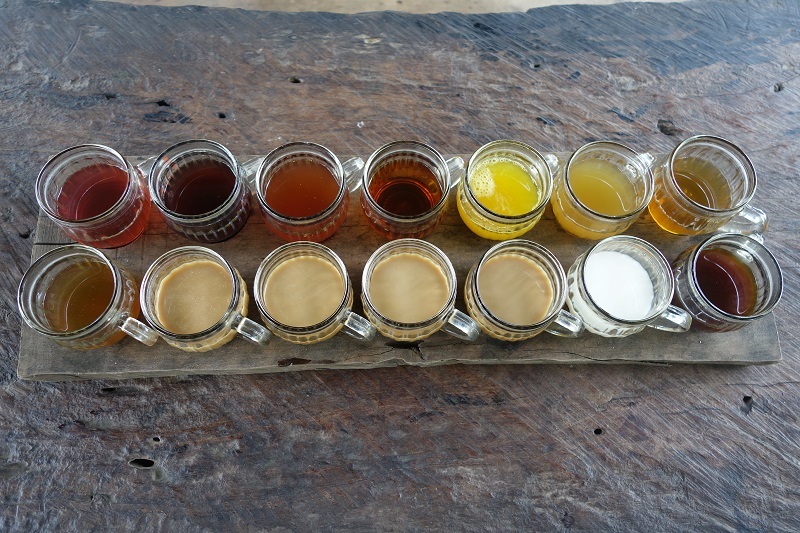 You can get a taste of Bali. No budget for a Bali trip? It’s okay. For the meantime, you can just fake it at the Inflatable Island’s Bali Lounge, inspired by Double Six Beach, a popular beach in Seminyak, Bali. Inflatable Island. See? Pretty close, huh? 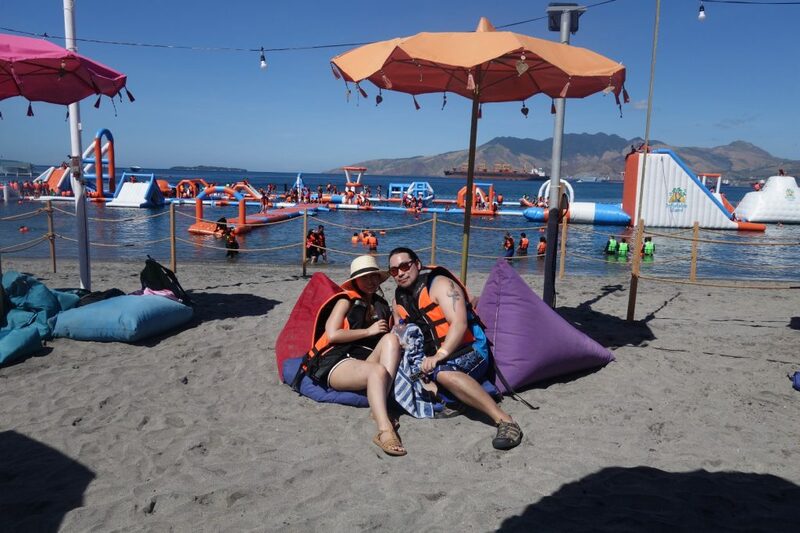 If swimming or playing on the inflatables is not your thing, and you’d rather sit, relax, and take gorgeous photos, you’ll want to secure a spot at the Bali Lounge. 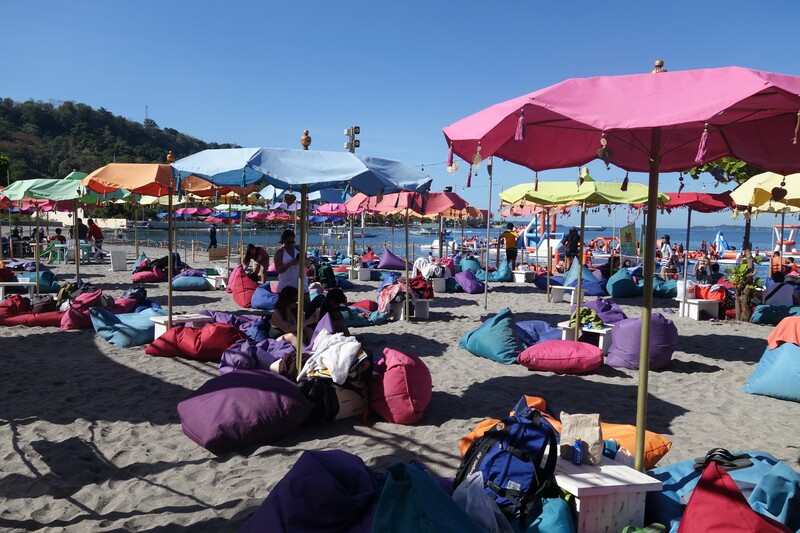 The colorful bean bags and umbrellas is a good place to chill and chow, but be sure to go early because these relaxation stations are first come, first served. You’ll have plenty to take photos of. Summer isn’t over yet, so go and book your passes for the Inflatable Island already if you want to experience a one-of-a-kind adventure! Height requirement: For kids, there is a height requirement of 3 ft. and above. Also, there is a 1:1 adult-kid ratio. 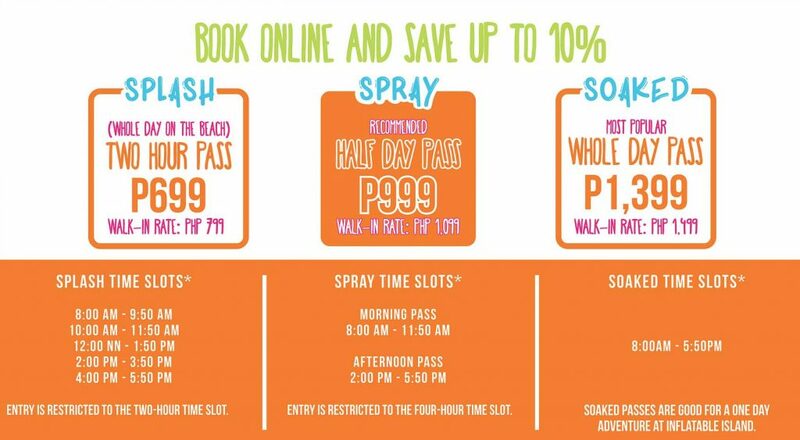 Booking: You can walk in, but if you want to save, it’s better to book online so that you get a 10% discount! 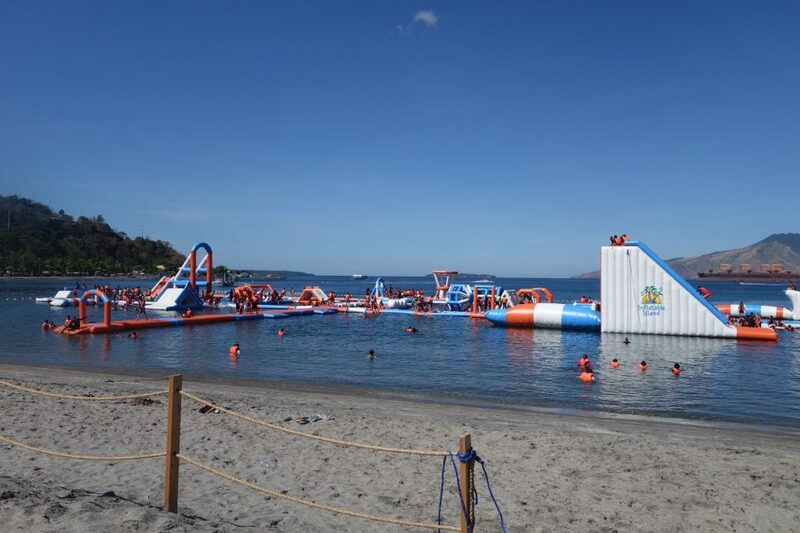 Come 30 minutes before your slot: There is a 30-minute orientation before you are allowed to go in the water playground. This is when they talk to you about the house rules, which you must observe, or else, they could pull you out of the playground. Gadgets: Action cameras, phones in waterproof cases, waterproof cameras, and selfie sticks (max of 1 ft) are allowed on the inflatables. Life vests: Life vests must be worn on the beach at all times! Attire: Your usual swimming attire (swimsuits, rash guards, board shorts, etc.) can be worn. Just make sure you are not wearing anything that could puncture the inflatables, such as jewelry or clothes with buttons or zippers. 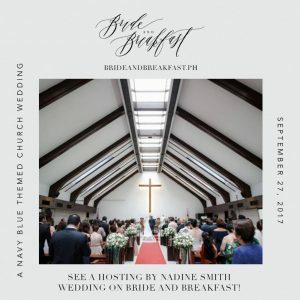 Lockers: You can store your things inside their lockers for a rental fee of PHP 100/150 (half day/whole day) for the big lockers and PHP 50/100 (half day/whole day) for the small lockers. The small lockers are tiny though, so if I were you, I’d leave my stuff in the car (if you have a car) and bring only the essentials. Food: You can’t bring your own food, but you can buy from the food stalls on the beach. That being said, make sure to bring some cash with you in case you get hungry or thirsty. Best time to go: I would say 8:00 AM or 4:00 PM would be the best times to go. It won’t be as hot during those times. 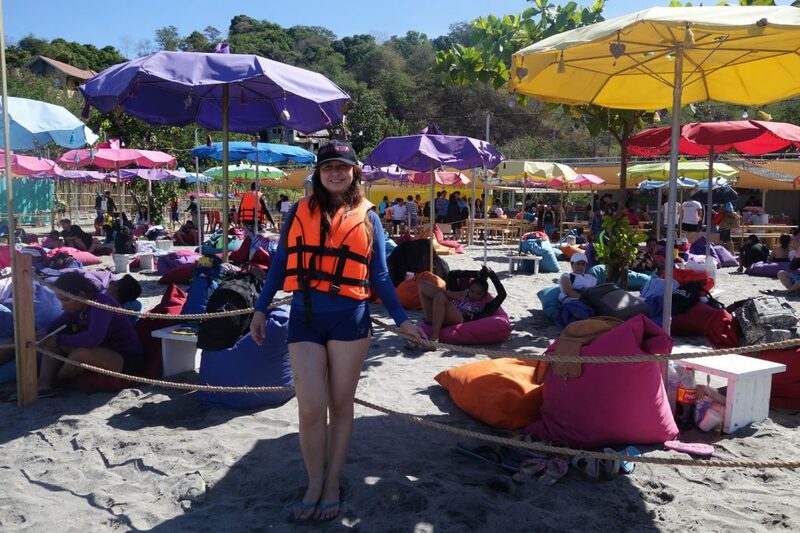 Ideal number of hours: For me, I’d say 2 hours is more than enough time to go on the inflatables, have a few snacks, and lounge around the beach. Disclosure: I received the half-day spray passes for free in exchange for a blog post. All opinions are my own and are not influenced in any way. Cheers! I just went here last month and I really had so much fun! This place brought out the inner kid in me… seriously, i was jumping out of joy playing with our group. 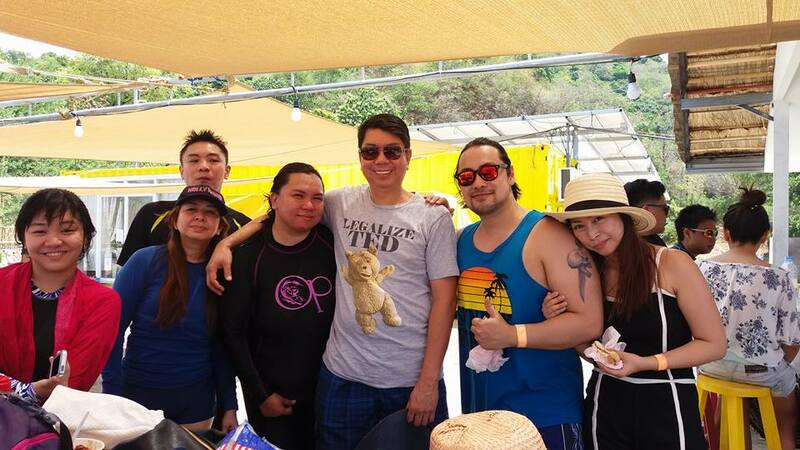 I tried almost every obstacles even that nerve wracking cliff dive thing haha… I’m excited to blog about my inflatable island experience too! The inflatable island looks awesome! I would have so much fun there. 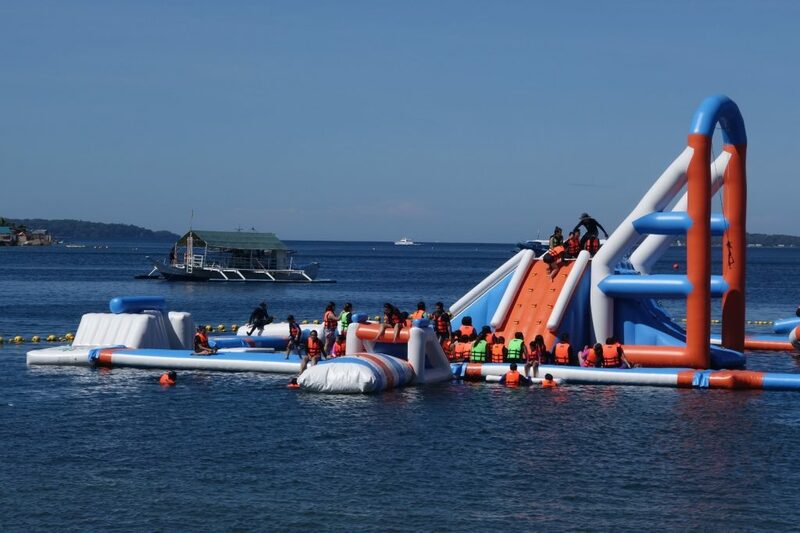 The biggest floating water playground in Asia? That is impressive. Too bad your phone and camera came in the salt water :(. I’m glad to read it’s not just for kids ;). Definitely keeping this in mind to go to some time. I’ve seen so many wonderful posts about the inflatable island from other bloggers. I would be very happy to be able to visit this place one day! I think it’s really cool! And another new concept for people is the fact that it’s inflatable! 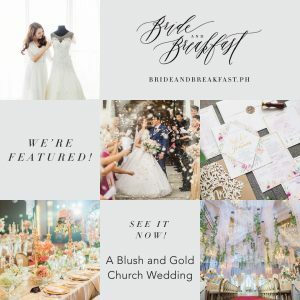 Not so common here in the PH but is slowly starting to make a name already. wow!This seems a unique place to enjoy a day.Glad that you have shared all the important information to visit inflatable island,so others can have great time there with proper preparation.Seems you all had a great day.And it seems lot of people visit this inflatable island. Nathalie recently posted…The power of imagination makes us infinite. I hope I visit this fantastic place one day. 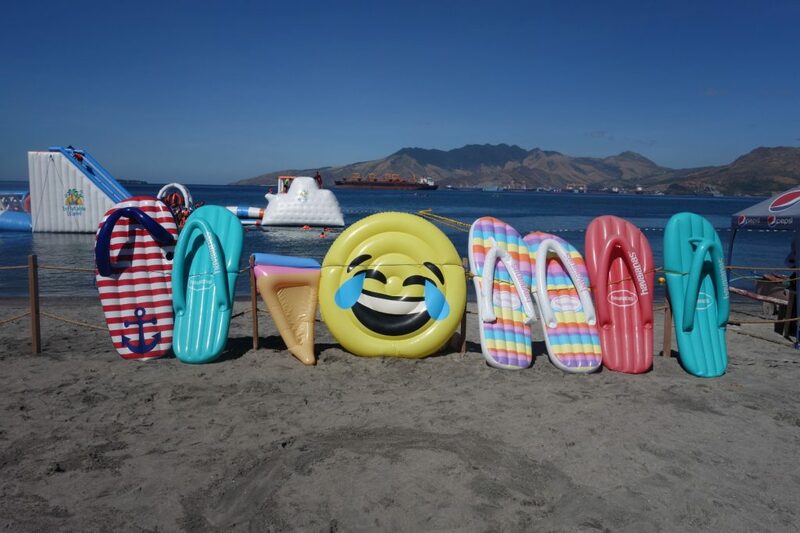 The inflated beach sandals and flip ons make this place a really very happy place to be in. And , indeed as you have rightly said, you have plenty of opportunities to take photographs. What I like the most are the clear blue skies of this resort. So refereshing! 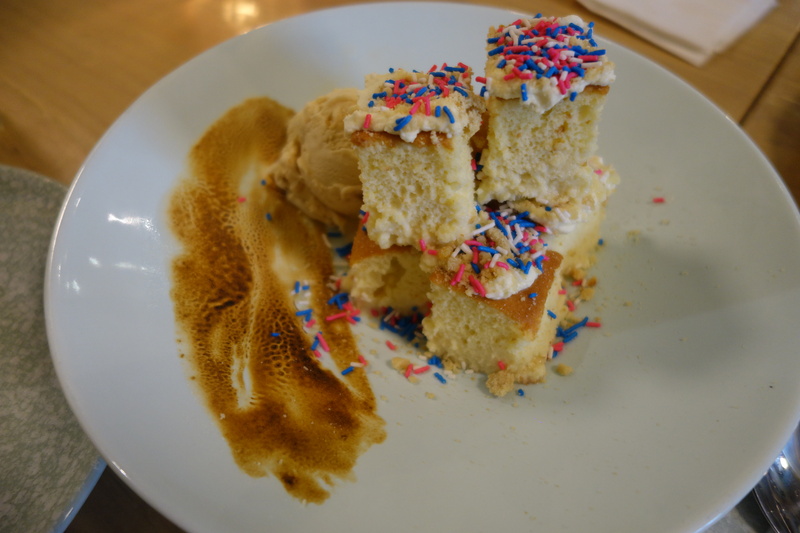 Maria recently posted…Life Lately: Howdy, May! How have you been doing? 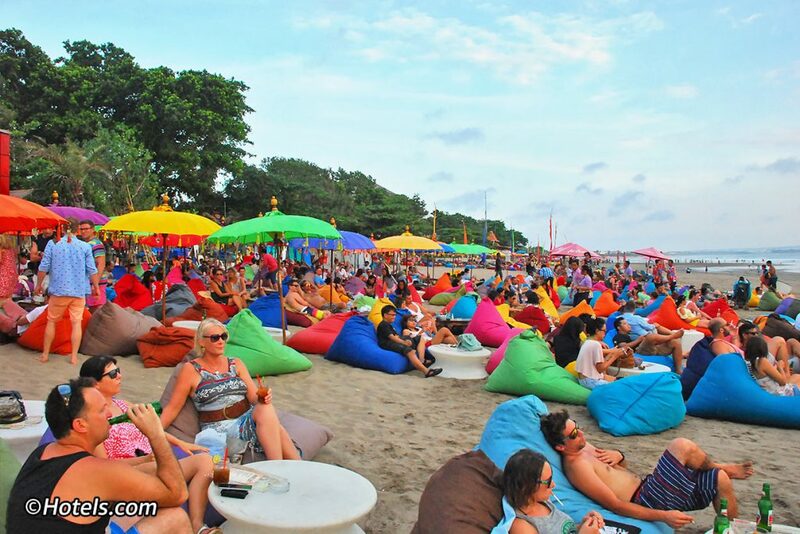 Since then, I’m not really a huge fan of a crowded place, especially beach like this or any place that is crowded. But I guess this seems to be a great place to enjoy and play. I heard this inflatable island and have been reading about it from other bloggers as well and it made me so curious. I actually saw one video about this and it looks like really fun. Anyway, reading your post seems that you really had a great time. The different colors I see are really beautiful. Thank you so much for sharing this with us. 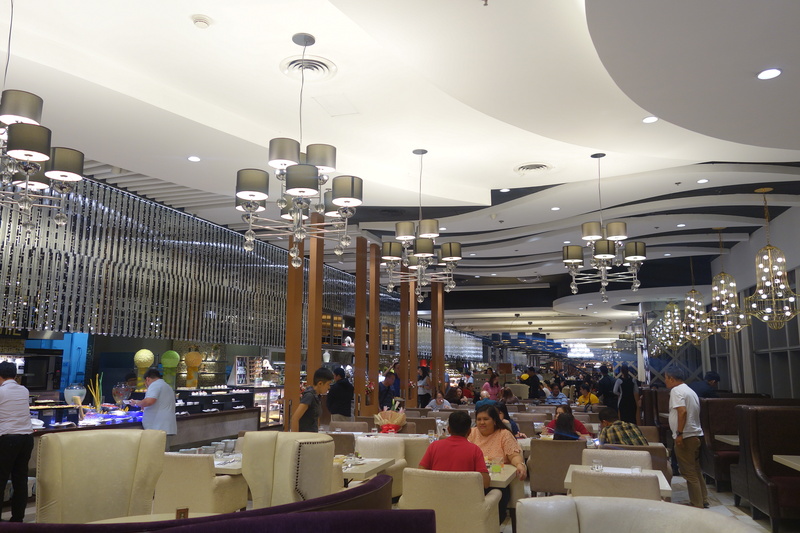 Oh by the way, though this place looks so crowded, but I notice that it is still so clean and that’s a big plus. I read this from some blogs and since then put the place as one of our possible last hurrahs for summer. You’re right. The place isnt just for kids but for kids at heart, too. Too bad I know I can’t join the fun as I am very heavy with a child. But surely, taking photos of my boys having fun is enough. How I wish we could really schedule a trip and that husband finds time. That looks like soo much fun, should put one up near ottawa for Candas 150th birthday!